Tanya Brown Merriman is a Chicago born educator and writer. Central to her work is exploring the use of different disciplines such as art, linguistics, history and technology to solve the pressing concerns of social and educational inequity. Tanya has taught in public, parochial and charter schools; she has taught nearly every grade level from Pre-K to doctoral students; and she has served as an administrator and designer of new schools, and curricular programs. She is a professor at University of Southern California, where her classes on social context, pedagogy, teaching English Language Arts, teaching History, and teaching linguistics. These classes and her work with pre-service teachers and with international students together with her extensive work in museums give her a panoramic, practiced view of education and the issues that impact our work. Tanya is the author of Those Who Can: A Handbook for Teaching and Social Reconstruction. She has contributed chapters on art, popular culture, activism and critical pedagogy. Her writing is featured on We Are Teachers and YourTango websites. 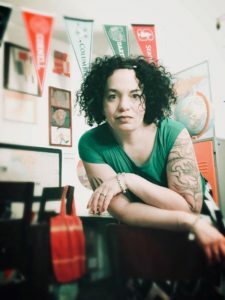 Her upcoming projects include a book that explores the Pedagogy of Sesame Street, a book that explores the finding common ground in a politically divided nation and COURSE™, a multimedia curriculum that supports intentional cultural competence for schools and families. Tanya lives in Los Angeles, CA with her husband and two children.